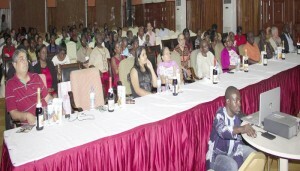 The much awaited film produced by Afrinity Productions entitled ‘London Maga’ was Sunday premiered in a grand style at a local hotel. The premiere of this latest movie was fully sponsored by the President of The Gambia, His Excellency Sheikh Professor Alhaji Dr Yahya AJJ Jammeh. ‘London Maga’ is a drama gingered with little comedy, prologue and acting based on one of the disturbing issues in Africa. It is a societal movie that explained the desperation of the youth with their nerve of travelling overseas for success. Without much ado, he made his decision; gave up his lucrative job and sold his properties to raise money for his ticket to Europe. Adamu finally made it to London but the rest story remains for you to find out. The 80-minute movie was produced by Adam Wilfred and co-directed by Adam Wilfred and Loft Goshien. It was acted in English language in different locations – United Kingdom and The Gambia. Speaking prior to the airing of the movie, Momodou C Joof, permanent secretary at the Ministry of Tourism and Culture, who represented the minister of Tourism and Culture on behalf of His Excellency the President of the Republic, thanked Afrinity Productions for coming up with such an educative and informative story. The movie, he revealed touched a vital issue, ‘back way’ (irregular migration) syndrome, which he noted is affecting the society. As the story depicted, the permanent secretary said, some youths have embarked on illegal journey to western countries and are facing some unfortunate scenarios as some died in the sea, and desert and those that were able to make it to Europe are facing some unbearable conditions. PS Joof advised the youth to tap the many opportunities that exist in country. He therefore congratulated the producer and his entire team for a job well done. The producer and director of the film, Adams Wilfred thanked His Excellency the President for sponsoring the premiere of the film. He as well expressed appreciation for the support and efforts of his family, entire crew and many others for the production of the movie.